Perhaps the quickest way to increase your wireless coverage in your house is to use a WiFi repeater. It’s not without its downsides technically, but it will deliver the required performance for the majority of consumers. There are literally hundreds to choose from, but the Aukey WiFi Repeater is one of the easiest to setup, that we’ve used. It’s also got some other features and connectivity methods for those who want to tinker. Let’s take a look. Let’s start with why one might need a device such as this. Let’s assume your router for your Internet connectivity has WiFi and is situated at one end of your house. You might be at the other end, or on another floor, and fail to get a good enough signal to stream, or to even browse the net. 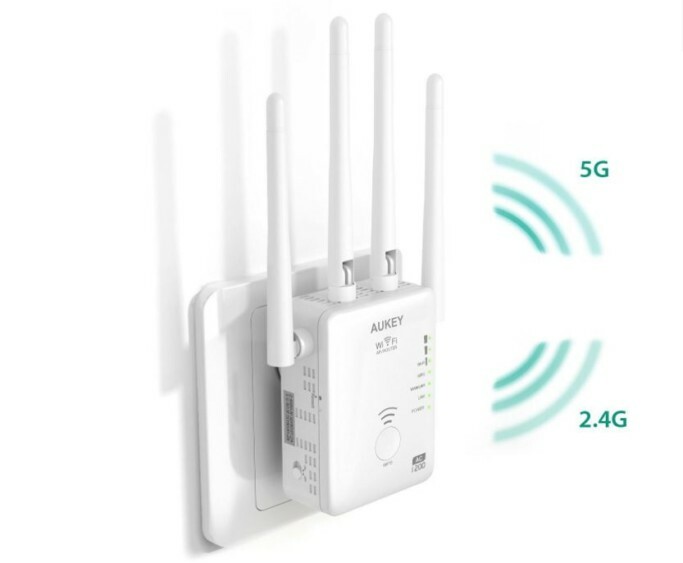 WiFi repeating is a method of putting in a “booster”, which latches onto the existing signal, and relays it from the repeater, thereby allowing connectivity where none was previously available. Let’s take a look around the product. Firstly, the unit is built to simply plug into a normal UK outlet, but be sure you have enough room (i.e. a small secondary plug if using a double socket) as this does take up a bit of real estate on the socket. The unit has 4 individual antennas connected to the main body. On said body you’ll find a WPS button front and centre to easily connect to your router (assuming it too has a WPS button), a reset button which will come in handy (believe us), an On/Off toggle switch as well as a mode selector with Repeater, AP (Access Point) and Router modes available. There are also some LED indicators on the front of the unit displaying power, LAN, WAN, WPS and WiFi strength statuses respectively. The unit comes with a good and simplistic step by step users’ guide that details exactly how to get on to the device to begin with, how to configure the various settings related to the mode of operation you want to use as well as some helpful troubleshooting tips. During this setup process we had no issues at all, and even tested the reset process to make sure we could start again from scratch. We’re happy to say that those who aren’t particularly tech savvy won’t have an issue as long as they stick with the instructions to set this unit up via the web address provided. Simply put, the process involved connecting to the units easy to find SSID, browsing to a web address, entering a default username and password, selecting which existing Wireless SSID you want to extend/connect to, and then giving the unit itself an SSID. That’s about the lot. For the purpose of our testing we mainly used the unit in repeater mode to extend the range of our existing wireless signal but we did test the AP function also. In AP mode, the unit acts as a stand alone wireless device, connected via ethernet cable (RJ45). Devices connect in to that unit and instead of using the original Wireless network to relay the data, the data is passed along the wired local area network via the RJ45. So, our Aukey WiFi Repeater is all setup, we’ve set a cool SSID for both the 2.4Ghz and 5Ghz channels (Peralta and Jeffords – Brooklyn Nine Nine’s finest) and given them a password. Just to throw in here, we could have named the channels the same SSID as our main WLAN SSIDs, but we didn’t. Not all units are made equally in this regard and the handover, unless the units are specifically meant to work in tandem, can be either aggressive or non-existent. There are of course pros to this approach, and many businesses employ this particular philosophy (no matter where a device is within the network they can access the same SSID with the same network, etc), a lot of SoHo/consumer units just aren’t all that good in that regard. We played it safe in any case and gave them unique SSIDs. Performance wise, they stacked up quite well when put next to an existing, brand less Wireless AC repeater. As you can see from the images, I was lucky to get 12Mbps throughput when accessing my router (based upstairs) from the conservatory, and from the garden the connection was near non-existent on the 2.4Ghz band. The brand less, cheapo repeater I was using, had only 2.4Ghz band, and was producing 22Mbps write speeds with slightly higher 25Mbps reading speeds. 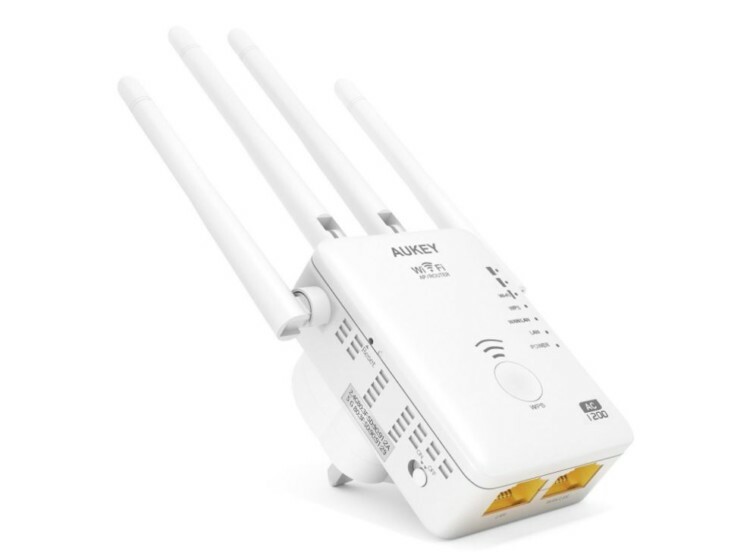 The Aukey repeater, situated the same distance from the main wireless router, was delivering improved write speeds of more than 27Mbps, however something strange happened with the read speeds. I did test to other network shares on different servers to ensure it wasn’t a bottleneck on the device to which I was connecting, but the result was the same. Utilising the AC connection produced the exact same result, as I’d have expected (and I’ll explain shortly). Your mileage will vary depending on situation, composition of the walls between the wireless points, and where exactly you are in respect to the repeater, but in this relatively simple test, the results speak for themselves. We do however have two gripes with the repeater. When setting up and choosing which SSID to repeat, you are essentially choosing the band to repeat also. Whilst the Aukey WiFi Repeater does offer multiple band support, that’s purely for connecting to that device, not further upstream. In essence, you can connect to a 5Ghz repeater band, only to be pushed down a 2.4Ghz band back to the router. This has advantages meaning that the throughput, at short distances, can improve back to the repeater, but they will always be throttled as they are passed back over your WLAN. Secondly, once in repeater mode, there is no accessing the management IP again, unless you reset the unit causing the original SSID to be visible. At this price range it is expected, however a management SSID at all times would have been nice (hidden of course). 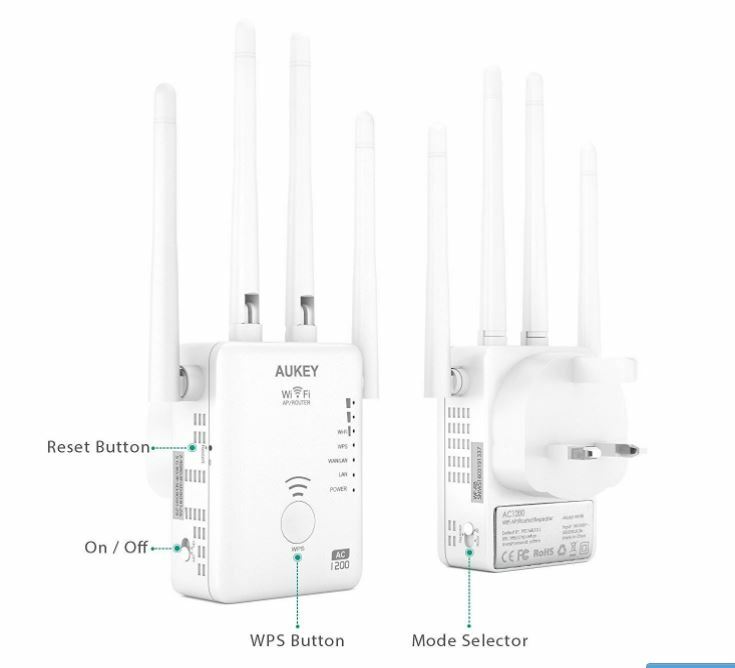 In summary, if you have a specific requirement to boost the signal in a portion of your house, the Aukey WiFi Repeater will do the job but how well it does it will vary dramatically. As was obvious from the results, the write speeds improved but the Aukey struggled with the read speeds whilst the brand less cheap repeater managed to maintain consistent results across both tests. Strange, but true. There are other ways to skin the wireless black spot cat though. For instance, you could move your main wireless router. If not possible, perhaps powerline adaptors might be your friend instead? If nothing else, you could powerline to the location in question and hang the repeater off it as an access point and hopefully improve the throughput that way (depending on your powerline connection). I’ve always maintained that powerline and repeaters should be used only in a pinch. Their performance can be erratic and inconsistent, and this, if you are looking to play games, or stream content over the connection, can be a right pain! Unfortunately this proved to be the case and is the main reason that I’ll be running some Cat 6 cable from my router to the back side of my house. What I’ll also be doing is utilising the Aukey WiFi repeater, but purely in an AP mode once that cable is run. I expect zero issues with throughput then. So, in summary, the Aukey Wifi Repeater did do the job it was intended for. It allows me to connect back to my network when at the extremities of my house which is a result. I’d be lying if I aid I was overly happy with the throughput, so I’m going to actually look at a better way of delivering the result, but, it ticked the box – barely.